I went into testing with high hopes, but I was still surprised to find that all of the kits I tried — Terra’s Kitchen, Marley Spoon, Fresh Realm, and Sun Basket — were well-executed and offered up exciting recipes. Truly, if you go with any of those four, I suspect you’ll be satisfied. 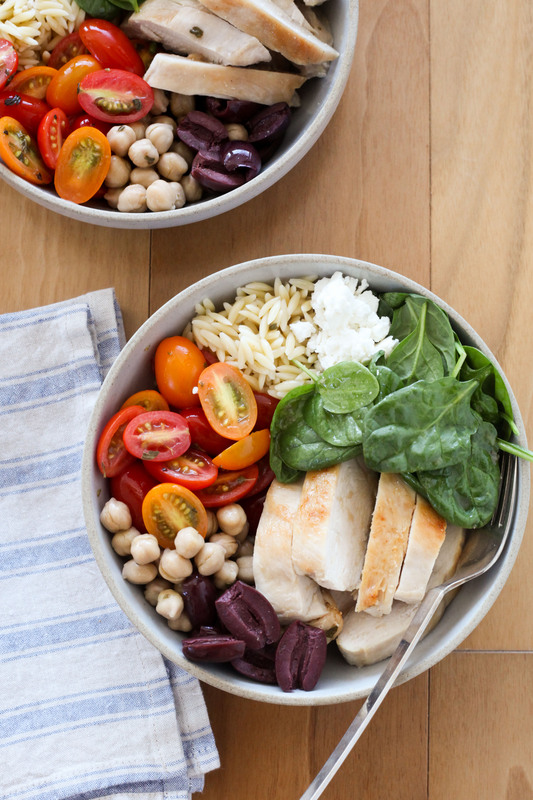 I’m planning to highlight a recipe from each of these, starting today with this Greek chicken, orzo, and chickpea bowl from Terra’s Kitchen. The neat thing about Terra’s Kitchen is that it offers up a wider range of recipes than is typical (about 40, updated seasonally), and most are quite healthful, and easy to prepare, true weeknight wonders. Add the red wine vinegar, garlic, oregano, and a large pinch of salt to a small mixing bowl. Make the dressing by very-slowly drizzling in the olive oil and whisking until emulsified. Season to taste with additional salt. Bring a medium pot of salted water to a boil. Add the orzo and cook until al dente (about 6 minutes), stirring when it's first added to ensure that it doesn't stick to the bottom of the pot. Drain. In a small mixing bowl, toss the orzo with about 1/4 of the dressing. Trim away any ragged bits of the chicken breasts, pat them dry with a paper towel, then season generously with salt. Add the neutral oil to a large cast iron or stainless steel skillet and heat over medium-high heat until shimmering and almost smoking. Swirl the oil to coat the skillet, then arrange the chicken smooth side down in the skillet; cook without moving the chicken, until it is well browned, about 3 minutes. Using tongs, flip the chicken; continue to cook until well browned, about 2 minutes. Reduce heat to medium and continue to cook, turning the chicken once or twice, until an instant-read thermometer inserted into the thickest part registers 160°F or it is no longer pink when cut into with paring knife, 3 to 5 minutes longer. Transfer the chicken to a plate and let rest 5 minutes. Then, slice the chicken breasts and toss with about 1/4 of the dressing. Meanwhile, toss the spinach, chickpeas, and tomatoes with the remaining dressing. 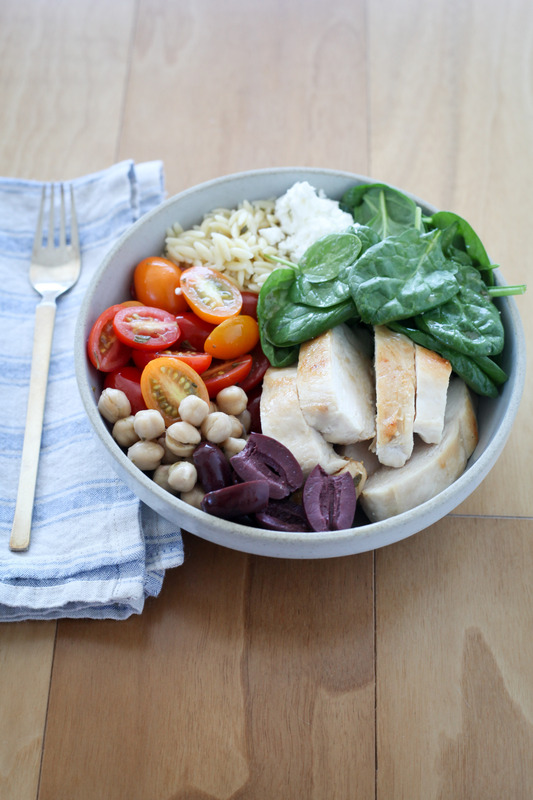 Divide the orzo, chicken, spinach, chickpeas, tomatoes, olives, and feta between two bowls.